Contrary to popular belief, a comic doesn't have to be technically perfect to be considered good or great. 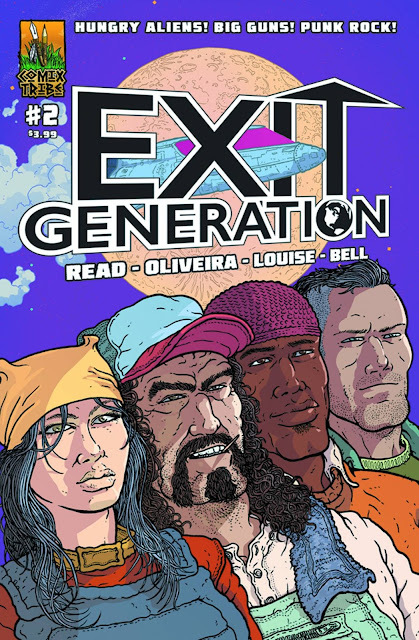 'Exit Generation' #2 is an enormously fun read that takes chances with things like plausibility, coincidence, and plot devices but the pacing and characters drive the action. Jack and Mo find the help they were looking for in order to try and rescue their loved ones from the clutches of a human-eating alien race named the Ruleians. Aliens vanish with your families and take off to space, what do you do? Well, if you're Jack and Mo you look for a way to get to space by seeking a pilot of some kind, right? It just so happens that the guy at the scrap yard was once a pilot, or so they think. They somehow convince the guy named Scrap to help them save their families. As luck would have it, he along with his teenage adopted daughter have a hidden fully functional command center complete with rocket and space shuttle ready to go. How fortuitous indeed! Meanwhile, the humans are being prepped for a feast by the Ruleians while in orbit. Luckily, they found an unlikely partner in Grunt, a guard who happens to be a vegetarian. Things look bleak but will Jack, Mo, Scrap and Hannah make it in time to save them all before they become the main course? It's this type of madness that makes 'Exit Generation' so enjoyable to read. It's not a parody, it's a pretty straight-forward sci-fi adventure book but it flows so smoothly and efficiently you can't wait to see what happens next. Sure, it's preposterous at times but it still captures your imagination. The fast-paced script and panel layouts help move things along before you've had too much time to think about it. Caio Oliveira does fantastic character designs especially while in space with the Ruleians. His style is reminscent of Simon Gane (They're Not Like Us) and Gabo (The Life After) with great attention to detail and Marissa Louise's bold and bright colors makes each page pop with a varied array of hues that add depth and warmth to each scene. 'Exit Generation' #2 has been a nice surprise and actually improves on the first issue. It's as good as any comic from the Big Two and probably better. It has some wild ideas and not even logic can triumph over sheer unadulterated entertainment. It's definitely worth adding to your pull list if you're looking for a good time.